A bear was trapped in a “torture vest” for years in China as part of a bile farm. An animal rescue group has posted new photos of the bear. The female bear, named Caesar, was trapped in a tiny cage for years, and the bile was drained from her gallbladder to be used in traditional medicine. 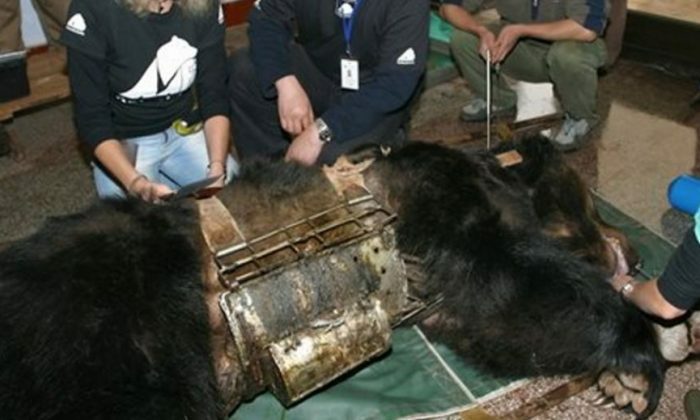 She was also placed in a “torture vest,” a metal cylinder that would help siphon out the bile, reported Animals Asia. Images of the bear in the vest were posted by the rescue group last week. Animals Asia described it as “the worst imaginable bile farm torture.” They eventually rescued Caesar. “To see her out in the sunshine—a dozen years on from her rescue—it’s hard to imagine her existence back then. That huge presence trapped in such a tiny, confining space. We’re honoured to be able to provide her a better life, and watching her enjoy her surroundings every day is an absolute pleasure,” Animals Asia China Bear and Vet Team Director Nic Field said. Animals Asia says there are at least 10,000 bears trapped in cages on Chinese bile farms. The most common species used to farm bile is the Asiatic black bear—but the sun bear and brown bear species are also used. Asiatic black bears and sun bears have been listed as Vulnerable on the Red List of Threatened Animals published by the International Union for Conservation of Nature. There is no evidence that bear bile has a medicinal effect, and there is no plausible mechanism by which it might work, according to Science-Based Medicine. However, the bile generates about $2 billion each year.